Now that it’s November, we’re giving ourselves full permission to go into sweet potato overdrive. Luckily, these beta-carotene-filled spuds are super versatile, so there’s no shortage of recipes to try. First up? Sweet potato and spinach quesadillas. This recipe provides a surprising new twist on the root veggie, which is usually baked, mashed, or fried. With a golden crispy outside and sweet, cheesy insides, these pockets of yumminess will hit all the right notes. 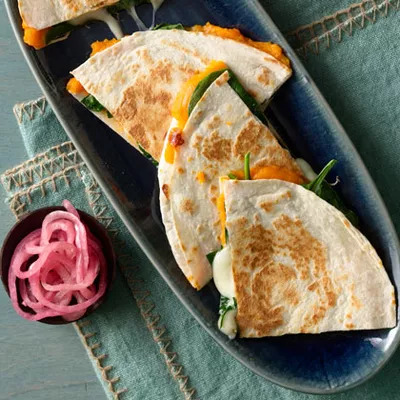 Cheesy quesadillas may sound like a comfort food--and they are--but not the kind that will leave you feeling bloated with regret. In addition to the magical powers of sweet potatoes, you’ll be treated to an extra dose of vitamin A and calcium from the baby spinach and mozzarella. The best part? These deliver less than 400 calories per serving. As if you needed another reason to make them!